For those of us who grew up on the East Coast, what little we knew about hula came from the movies. Shortly after moving to San Francisco on my 25th birthday, traditional (as opposed to commercial) hula became more visible to me. In 1977, during a week-long vacation in Seattle to attend a production of Richard Wagner's Der Ring des Nibelungen sung in English, I took a day-long tour to the famous Butchart Gardens in Victoria, British Columbia. As our sightseeing boat headed across Puget Sound, I was surprised to see a small group of elderly Asian women practicing hula on the front deck to help pass the time. "There was no written language in the Hawaiian culture. History and legends were passed from one family to another through chants. Some of the chants were very poetic. The common people couldn't understand them, which is why dancing was used to illustrate what was being said. The chant was important, not the dancing. Today it's reversed. Ten years ago, when a group from Los Angeles participated in the Merry Monarch Hula Competition in Hilo, they performed their idea of Hawaiian dancing. These Hollywood people came out in feather capes chanting all kinds of stuff without even knowing the language! The native Hawaiians (who were performing ancient and modern hulas) were laughing so hard that there were tears streaming down their cheeks! Hula dancing is a lot like sign language: If you don't know the language, you can't enjoy it as much. When the Islanders heard that a group from San Francisco was competing, they thought they could have themselves another good laugh. They thought we would all have blond hair and blue eyes. But we looked like locals, instead. Not only did our Hawaiian cowboy hula place third in the modern hula division, we also put San Francisco on the Hawaiian map by showing them that we knew what we were doing." In 1990, while in Honolulu, I caught a production by Hawaii Opera Theatre in which Mozart's Cosi Fan Tutte had been updated to the Hawaiian monarchy period and renamed Pela No Ho'i Na Wahine. The production's scrim had been inspired by Madge Tennent's drawings of Hawaiian women. Ferrando and Guglielmo became two American naval officers stationed in Hawaii at the turn of the century while Don Alfonso was renamed Don Amalu and portrayed as an elderly local Hawaiian happy to take their money. Fiordiligi was renamed Pualani, Dorabella became Keanani, and Despina was transformed into a girl from Maui named Leilani, who clearly understood that "to catch mynah bird, you use guava." "Addio" was translated into "Aloha," "Ziti, Ziti" became "Wiki Wiki" and, at one point, Don Amalu told someone to "Shoto make!" (Shut up!). The action took place on the lanai and in the gardens of a Waikiki hotel (with Diamond Head visible on a backdrop). Drinks were served on the hotel's patio by a huge Samoan man dressed in a sarong and, before the men sailed off to war in an outrigger canoe, the girls dutifully draped floral leis around their necks. A chorus of three lei sellers in traditional Hawaiian costumes sat on the side of the stage interpreting the trio sung by Don Amalu, Pualani, and Keanani with hula gestures. Before you could say King Kamehameha, the men returned disguised as two rakes from the Russian colony on Lahaina. When the two sisters tried to remain faithful to their boyfriends, Leilani chided them by asking "Are you two wahine? Or are you...coconuts?" In Act II, when Despina is required to disguise herself as a physician, Leilani entered dressed as a Hawaiian kahuna carrying a lump of glowing lava. For the wedding scene, she reappeared in the guise of a Chinese lawyer from Yick Lum Plum (a corporation that made a popular snack food in Hawaii). John Kaimikaua, a local Kumu Hula who gave me a crash course in hula's role in keeping Hawaii's oral tradition alive. Since then, I have attended several Bay area hula events at which the smell of fresh flower leis was simply intoxicating. Because so many Hawaiians have settled in the San Francisco Bay Area, hula concerts showcasing local halaus take place throughout the year. Sponsored by the Kumu Hula Association of Northern California, Ia 'Oe E Ka La 2010 will take place at the Alameda County Fairgrounds from November 5-7. In celebration of 25 years of hula under its founder and Kumu Hula, Patrick Makuakane, San Francisco's most famous halau, Na Lei Hulu I Ka Wekiu, debuted its latest show at the Palace of Fine Arts on October 16. Na Lei Hulu I Ka Wekiu's performances are wondrously rich in costume, song, and Hawaiian history. 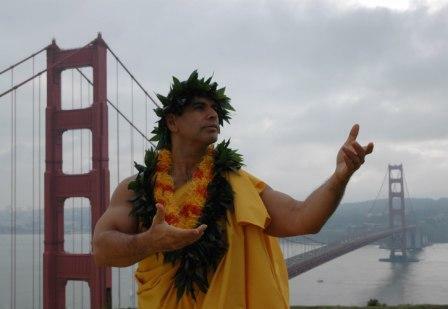 Ever since arriving in the Bay area as a student, Makuakane has been teaching and promoting hula. On a recent tour of Japan with several Hawaiian hula troupes, he was amazed to discover that more than 250,000 people are studying hula in Japan! As Makuakane's hula concerts have grown more technically sophisticated -- and Na Lei Hulu I Ka Wekiu's audiences have grown in size -- it's been easy for people to overlook Patrick's strength as a showman and choreographer with a keen artistic vision. Part of Makuakane's strength has been to choreograph traditional (kahiko) and contemporary ('auana) hula pieces. However, with a company of 40 dancers, Makuakane's trademark has been his success with hula mua (hula that evolves). He has created numerous nontraditional hulas that use music ranging from Delibes to techno, from popular songs like "I Left My Heart in San Francisco" to "The First Time Ever I Saw Your Face." He has won numerous awards for his choreography and direction, including several Isadora Duncan Dance Awards ("Izzies") and a lifetime achievement award from the San Francisco Ethnic Dance Festival. Na Lei Hulu I Ka Wekiu's 25 Years of Hula show opened with a section devoted to the impact of the missionaries on native Hawaiians. The powerful last two numbers in this part of the program ("Walk With Me" and "Save Me") would fit beautifully into the repertoire of any modern dance company. "To commemorate our silver anniversary, we are excited to present the full-length premiere of Ke Kumulipo -- He ho'ohanohano (The Kumulipo -- An Homage). The Kumulipo is an epic Hawaiian creation chant that majestically recounts the evolution of the world we live in. Our homage to the Kumulipo depicts the birthing of sea plants and animals, the creation of mountainous islands, the rich flora and fauna that cover the land, and the emergence of the first men and women and their subsequent generations. We collaborated once again with Hawaiian scholar Lucia Tarallo Jensen, who provided an insightful and profound translation of this ancient poem, reclaiming nature's song of origin. The Kumulipo expresses harmony with our environment and ultimately highlights our connectedness with the natural world, with each other, and with everything around us. We believe this ambitious project marks the first time that this tale has been brought to life through hula." Makuakane's hula shows have always paid respect to the Hawaiian culture's love of nature. With this year's push toward an increased use of multimedia, the audience was treated to some spectacular video effects by Wally Murray while performers were showcased by Patty-Ann Farrell's sensuous lighting designs. As always, Makuakane's chanting and narration were a highlight of the evening. A collection of videos on YouTube show a series of "Hit and Run Hula" performances by Na Lei Hulu I Ka Wekiu, including the following performance on the slopes of San Francisco's Dolores Park.